01 December 2017, 08:25 Figuring out your best options for solar on your home can be daunting. 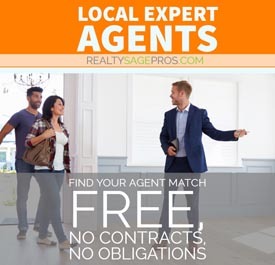 This excellent article by energysage.com gives you great information to start off the converstion with your solar installer. Power output or wattage is an important factor to consider when comparing solar panel options. You may hear your solar installer say, “it’s a 255 Watt panel” or “the panel I am recommending has a wattage of 300.” Or, when you are reading a quote from a solar installer, you might see numbers like 245W, 300W, or 345W next to the name of the panel. They are all referring to a solar panel’s wattage, capacity and power output. So, what is the typical output of solar panels? All solar panels are rated by the amount of DC (direct current) power they produce under standard test conditions. Solar panel power output is expressed in units of watts (W), and represents the panel’s theoretical power production under ideal sunlight and temperature conditions. Most home solar panels on the market today have power output ratings ranging from 250 to 400 watts, with higher power ratings generally considered preferable to lower power ratings. 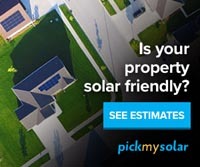 Pricing in solar is typically measured in dollars per watt ($/W), and the total wattage of your solar panels plays a significant part in the overall cost of your solar system. Power output is an important metric for your home or commercial solar panel system. When you buy or install a solar photovoltaic (PV) energy system, the price you pay is typically based on the total power output of the solar panels in the system (expressed in watts or kilowatts). Solar panel wattage represents a solar panel’s theoretical power production under ideal sunlight and temperature conditions. Wattage is calculated by multiplying volts x amps where volts represents the amount of force of the electricity and amperes (amps) refers to the aggregate amount of energy used. The financial savings you derive from the solar system is a result of the electric energy that it generates over time (expressed in kilowatt-hours). 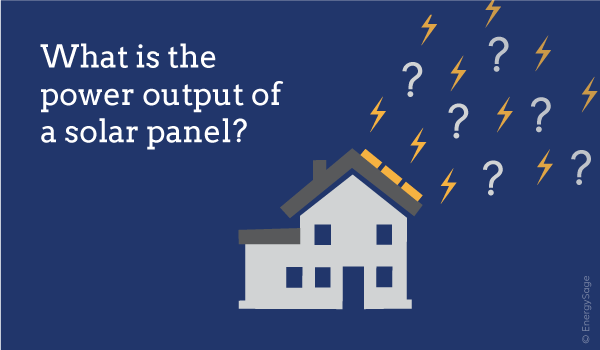 Power output on its own is not a complete indicator of a panel’s quality and performance characteristics. For some panels, their high power output rating is due to their larger physical size rather than their higher efficiency or technological superiority. For example, if two solar panels both have 15 percent efficiency ratings, but one has a power output rating of 250 watts and the other is rated at 300 watts, it means that the 300-watt panel is about 20 percent physically larger than the 250-watt panel. That’s why EnergySage and other industry experts view panel efficiency as being a more indicative criterion of solar panel performance strength than solar capacity alone. The electricity generated by a solar PV system is governed by its rated power output, but it’s also dependent on other factors such as panel efficiency and temperature sensitivity, as well as the degree of shading that the system experiences and the tilt angle and azimuth of the roof on which it’s installed. As a general rule of thumb, it makes prudent financial sense to install a solar system with as much power output as you can afford (or that your roof will accommodate). That will ensure you maximize your savings and speed up the payback period of your solar energy system. Find out more about average prices for solar across the country for 3kW,4kW, 5kW, 6kW, 7kW, 8 kW and 10kW solar systems.The EnergySage Solar Marketplace makes it easy for you to compare your savings from solar panels with various power output ratings. 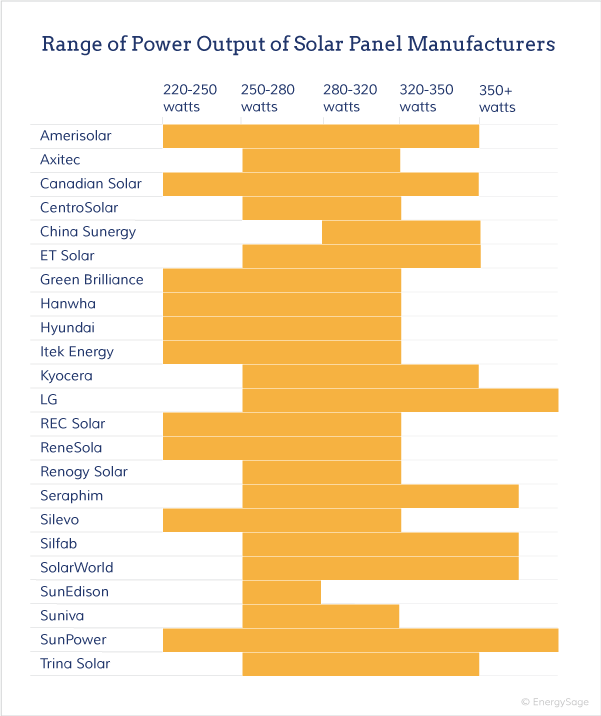 The two graphics below present different views of power output from the leading manufacturers who supply solar panels to the U.S. market. Because panel manufacturers often produce more than one line of solar panel models, the power output of most (company's models) has a significant range. Figure 1 illustrates the range of power outputs offered by each manufacturer’s panel products, and Figure 2 lists the minimum, maximum, and average power outputs of the solar panels within each manufacturer’s portfolio.